The recent appointment of Mario Monti as Italian prime minister has already given rise to a slew of puns and other word-play on his name (which means "mountains," and in fact he is from Varese near the Alps.) An obvious one I've already seen a few times is "the Full Monti." I'm sure there will be others. But let's look at the expression mare e monti: sea and mountains. It's easy to see why such an expression would be common in Italy, whose geography is dominated by highlands and the sea, sometimes in close proximity (as in the coast of Tuscany). Historically, Italians have taken their vacations at the seaside (most of them) or the mountains/hills, to get away from the heat. They still tend to do this, even with the advent of air-conditioning, of which they are rather afraid. Yes, Italians still mistrust air-conditioning, fans (especially at night, blowing on you when you sleep), open windows and drafts (even in August), and ice in their drinks. Last but certainly not least is the gastronomic term mare e monti to indicate a dish which includes ingredients from the sea and from mountains or hills. These are sometimes dishes that feature meat and fish (like our "surf and turf" in the US), or they include seafood and say, mushrooms or even truffles (yum). 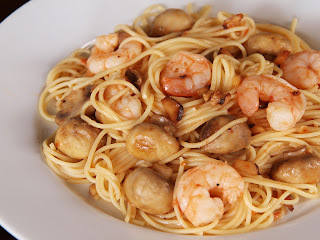 I personally am partial to the shrimp and mushroom combination, as seen in the photo.